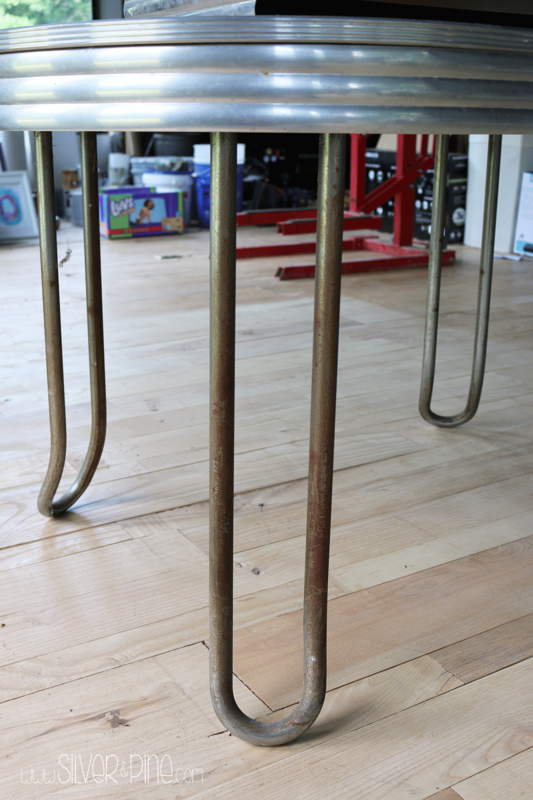 Here is the before….the legs and sides were covered in rust. And the top was a cream/puke kind of color….not really my favorite combo. Laminate has a reputation of being tricky to paint. If you don’t do it right, the paint won’t adhere to the surface. Being that my laminate table is holding up so well, if you follow these steps, yours should do the same. I don’t have a picture of the cleaning part of this project, but it is really simple. 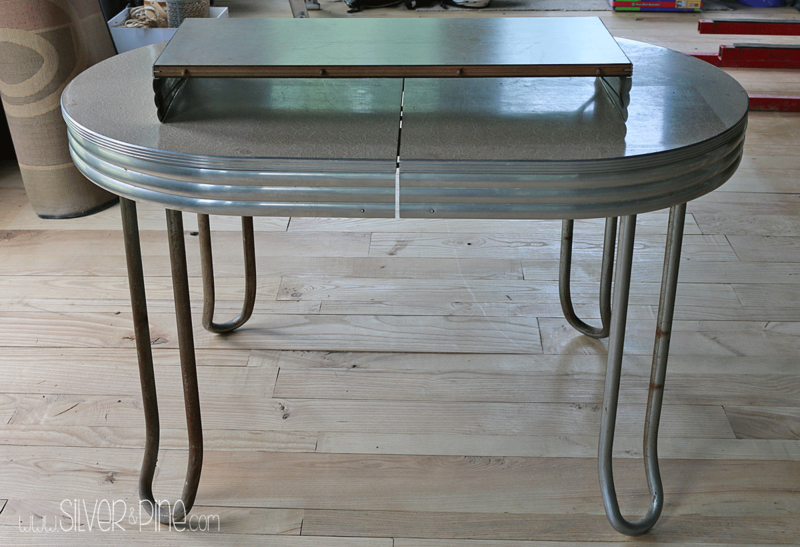 For the legs and sides of the table, I used Bar Keeper’s friend, just like I did here…. 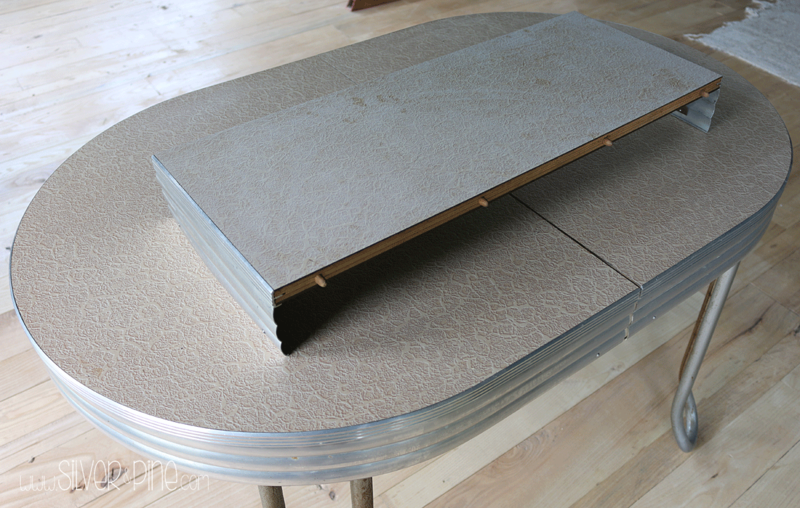 It is important to clean before sanding, so you don’t grind any dirt and grime into the surface. All of the rust came off, so nice and shiny right? 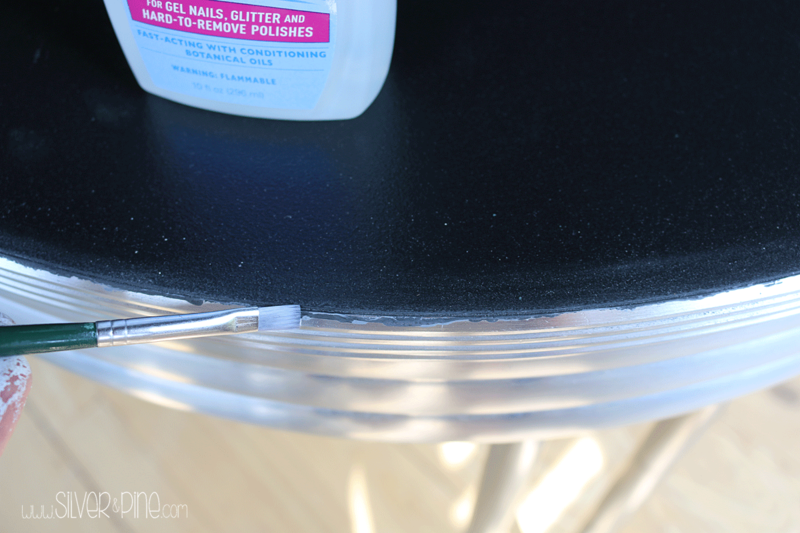 For the rest of the laminate table, use a multi-purpose cleaner, and just scrub it to death. 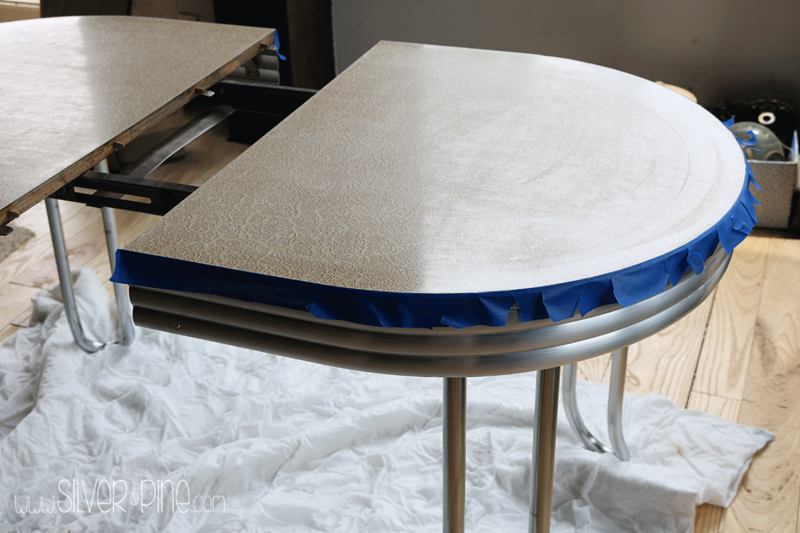 After it is clean and dry, use a coarse sandpaper and sand the top. I tried to capture the scuff marks in the photo above. 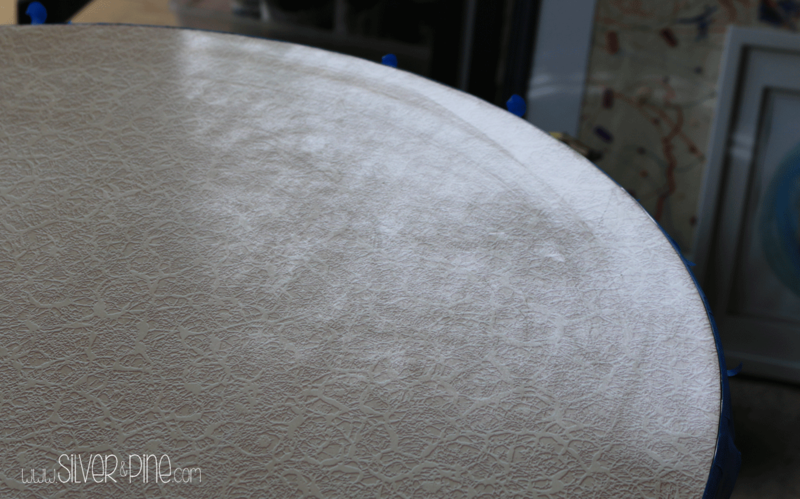 You don’t want to dig into the surface, but you want to scuff it up enough so the primer has something to stick to. 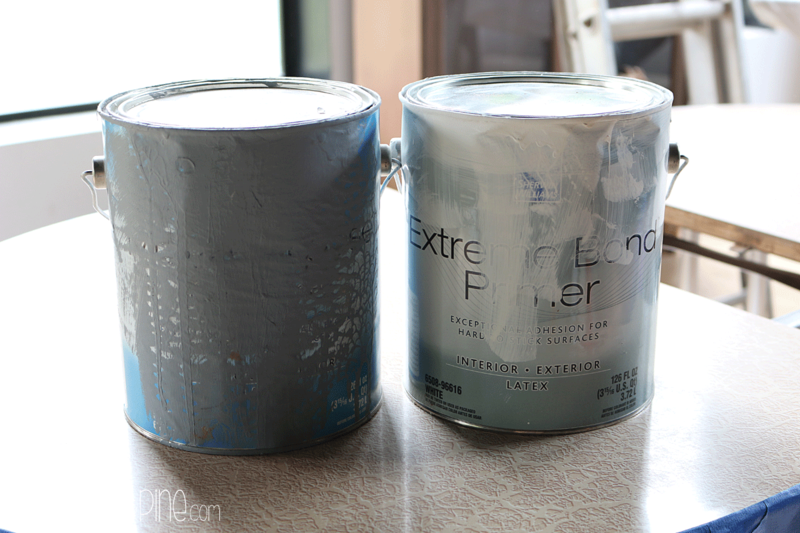 My favorite primer to use on these type of projects is Sherwin Williams’ Extreme Bond Primer. I have it in white and gray. 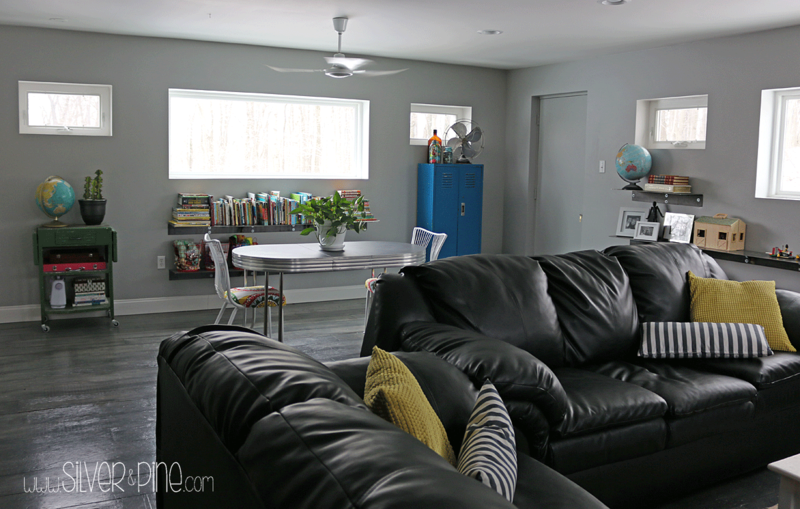 I used the gray primer because my finish coat was going to be black. If you decide to finish with a lighter color, then use the white. 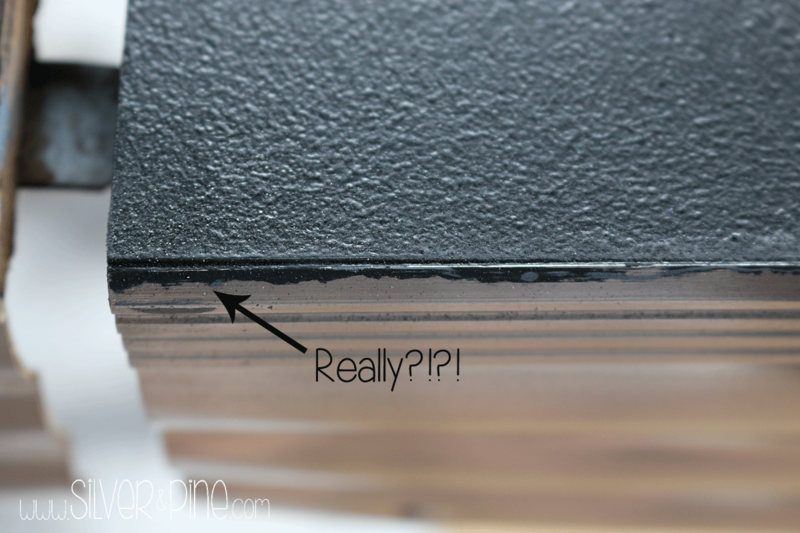 I used painter’s tape to protect the edge, but if you read on you will find that this was a totally unnecessary step. Wait until the primer was completely dry, give it a few hours just to be safe, then apply the top coat. 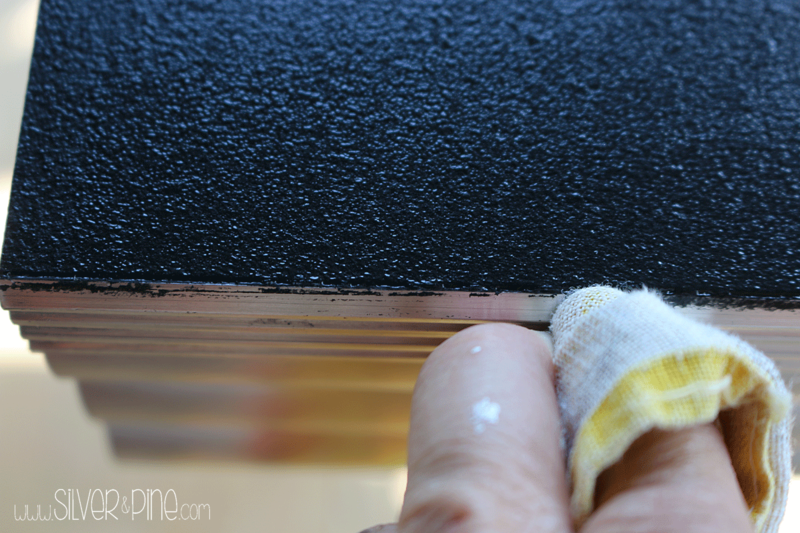 I used a foam roller for each coat, and did a total of 3 coats of Sherwin Williams Tricorn Black. Now this is about the time in any project when peeling off the painter’s tape is like opening a Christmas present….this time, not so much. Even though I took the time to tape off the edge, a tiny bit of paint still seeped thru. And being that Sherwin Williams makes such superior primer, it would not come off. I used a small brush with some nail polish remover and slowly remove the paint. 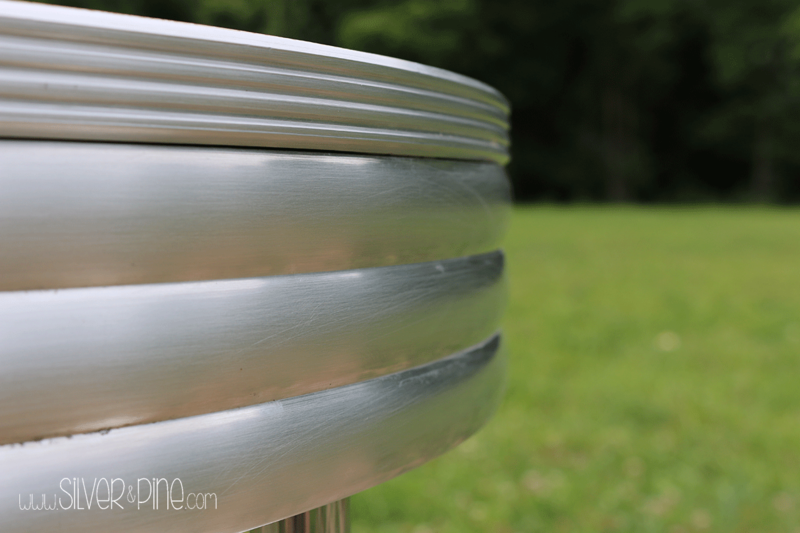 The base of the table is aluminum, so I was hesitant to use anything sharp to scrape it off, in case it marked the surface. To say I was frustrated would be an understatement……. Once that task was done, I noticed that my roller left lines on the surface. I already applied 2 coats of black paint. 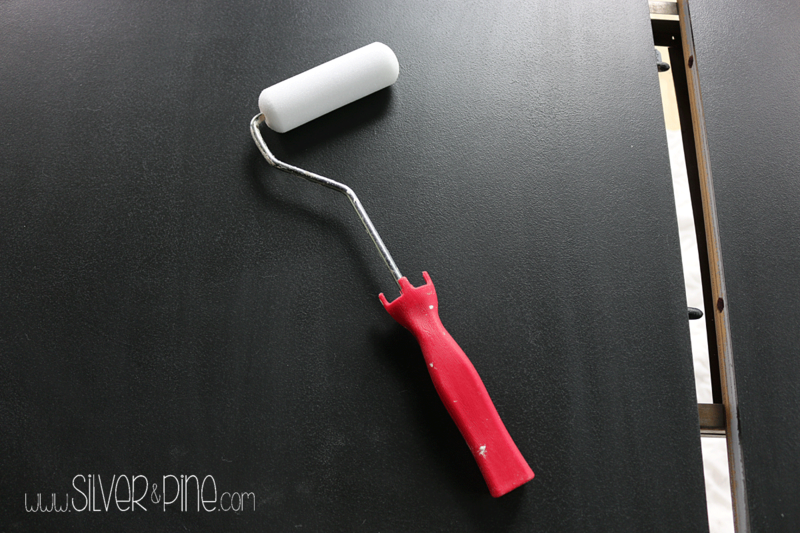 My husband suggested to apply a third coat with the paint watered down, so I added about 2 tablespoons of water to my paint and applied the third coat. It was perfect. At this time, while cleaning up a little bit of paint off the edge, I realized that when the paint was wet, it wiped off just fine. I am not sure if it is because the edge is metal, but all of the taping I did was not really necessary. 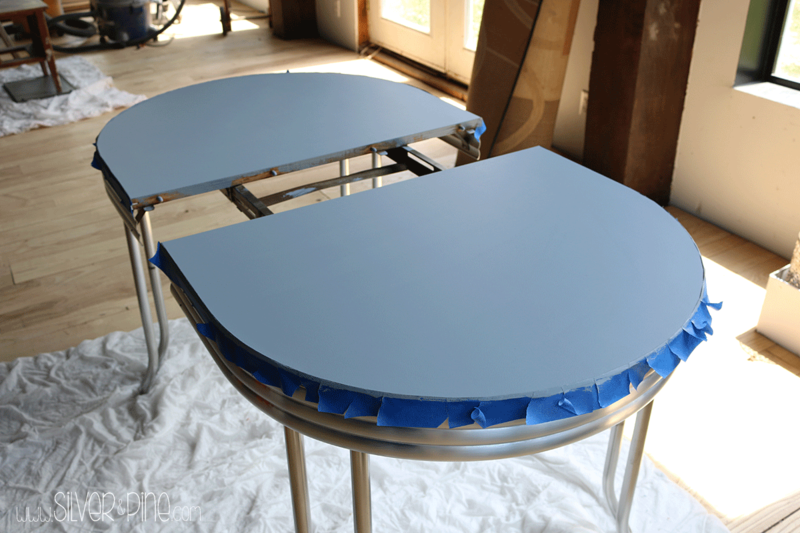 What I am trying to say is if you decide to paint a laminate table and it is similar to mine, you might be OK not taping the edge and just going along with a wet rag and wiping off any excess paint. Just be sure to do it while the paint is still wet. After waiting a few day before taking it upstairs, just to make sure it was really dry, it was soon a popular hang out spot. There are a few scuff marks here and there, but the paint has stayed put. Considering that four kids throw stuff on it everyday and it still looks this good, I would say this project was a success! 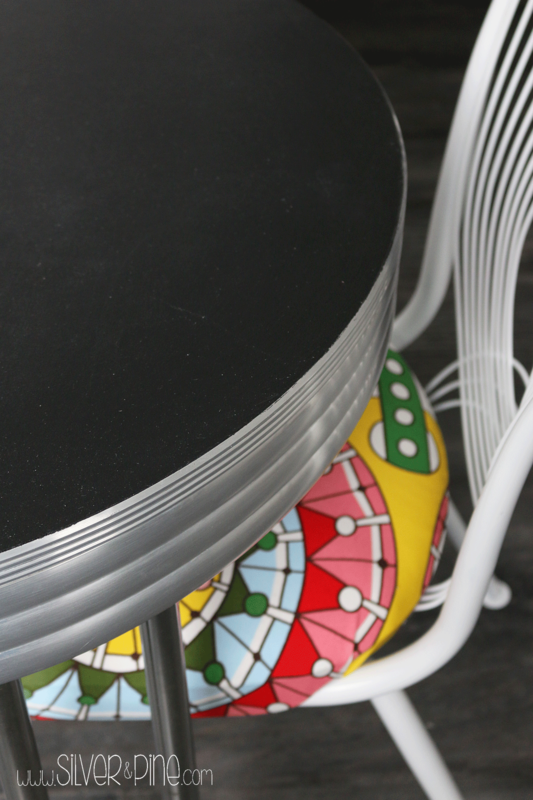 At first, I went back and forth a bit between painting the table white or black. 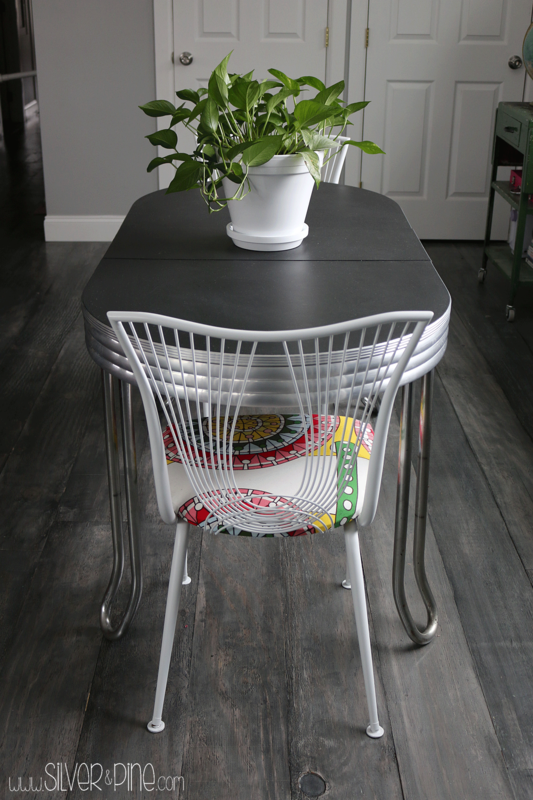 Black was the perfect color choice, and my white chairs, which I found on the curb, are the perfect fit. The kids haven’t actually used it for homework yet, as we still use the kitchen table, but it has been used for coloring, sewing projects, and building Lego forts. 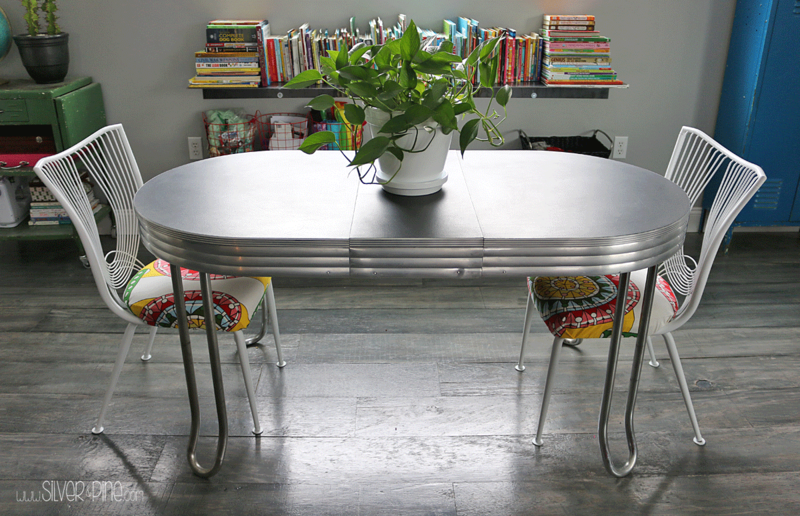 This table is the perfect addition to the room. 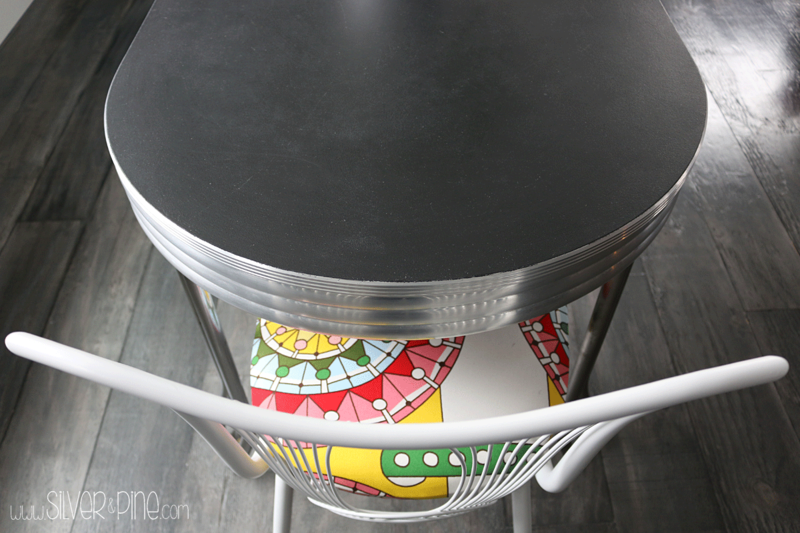 If you decide to do a project like this and want to use it in your kitchen where it will be exposed to water and food, you might want to consider putting a clear coat on the top just to protect your tabletop. I just finished the other two chairs today, which were found on a different curb, LOL, and I hope to share that transformation next week. Thanks for following along!